ABS-CBN Integrated News and Current Affairs head Ging Reyes addresses partners from poll watchdogs, academic institutions, professional associations, advocacy groups, and government agencies during the Halalan 2019 covenant signing for a peaceful, clean, and orderly elections. ABS-CBN News unites with the Commission on Elections (COMELEC), poll watchdogs, academic institutions, professional associations, advocacy groups, government agencies, YouTube, and Twitter to give Filipinos a louder voice in the coming midterm national elections through its “Halalan 2019” comprehensive special election coverage on radio, television, and digital. 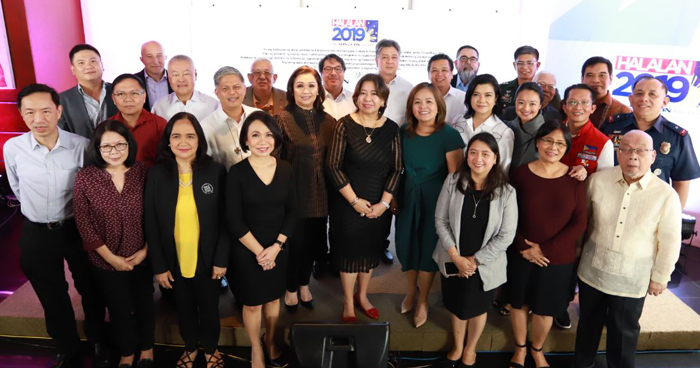 Together with COMELEC, Youtube, and Twitter, the following are helping ABS-CBN News cover the 2019 elections: the Armed Forces of the Philippines (AFP), the Philippine National Police (PNP), and the Department of Foreign Affairs Overseas, Voting Secretariat, Department of Education (DepEd), leading broadsheet Manila Bulletin, news organization VERA Files, and election monitoring groups National Citizens' Movement for Free Elections (NAMFREL), YouthVote, Parish Pastoral Council for Responsible Voting (PPCRV), and Kontra Daya.